Niagara Fiberboard manufactures various thicknesses and sizes of paperboard and has economical solutions for your industrial packaging problems. Extremely sturdy, these packaging materials provide dependable and economical protection for steel and other industrial products. We can also custom-engineer packaging products to meet your specific requirements. All packaging materials from Niagara Fiberboard are 100% recyclable, meeting global industry shipping regulations. 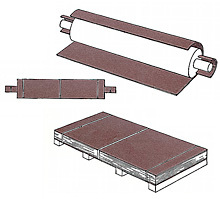 Multi-purpose, two-sided smooth board featuring widths to 96"
Eleven nominal thicknesses: .080", .090", .100", .125", .160", .187", .200", .250", .330", .375" & 500"
Provided in sheets or rolls and in thicknesses from .012" to .070"
Click here to view our complete Single Ply Chipboard product line. Caliper .120 - .400; widths 2" x 2", 2-1/2" x 2-1/2", 3" x 3"
.040" and .050" thick; 9-1/2" and 5-1/2" widths.